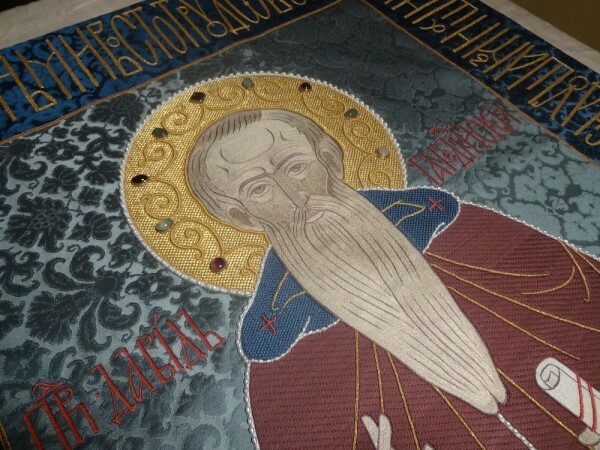 Parishioners of the Church of the Life-Giving Trinity located at the Pokrovsky Gate in Moscow have embroidered a cover for the tomb of St. David of Gareji and exhibited it on 26 March 2015. Archpriest Igor Yakimchuk, DECR secretary for inter-Orthodox relations attended the presentation with the blessing of Metropolitan Hilarion of Volokolamsk. Rector of the church, archpriest Ioann Kaleda told those present about St. David who had lived in the 6th century and about the monasteries he founded which bear his name and are located some 60 km from Tbilisi. The cover, embroidered in accordance with an Old Russian church tradition, was performed by the parishioners in fulfillment of a vow they made during their pilgrimage to the Monasteries of St. David of Gareji in 2011.